Before issuing their annual awards, the Consumer Guide Automotive editorial team evaluates vehicles based on attributes valued by today’s consumer: price, features, performance, accommodations, fuel economy, reliability, and resale value. Consumer Guide Automotive editors and road testers also test drive the vehicles through a variety of different driving experiences, including rural areas, highways and road trips. This year, 39 Best Buys have been awarded in 20 classes, and the 2016 Hyundai Genesis Sedan, and the 2016 Hyundai Santa Fe model range, are among them. After extensive testing, the Genesis was called a Large Car Best Buy, while the Santa Fe earned the coveted title in the hotly competitive midsize crossover SUV category. 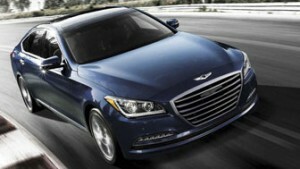 Since its launch, the Genesis Sedan has questioned the need to spend tens of thousands more on a high-dollar luxury sedan, thanks in no small part to its advanced quality, design, feature content and high-value approach to delivering a truly world-class motoring experience. The Santa Fe, available in both standard and extended-wheelbase variants, continue to be unbeatable market leaders in the segment, offering a finely honed blend of styling, feature content, safety performance and overall value that resonates strongly with today’s budget-minded crossover shopper. 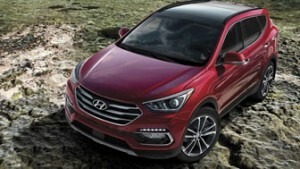 Notably, the Santa Fe offers leading fuel-saving technology, and advanced All-Wheel Drive technology, on all models. The latest accolades from Consumer Guide Automotive are just one of many reasons to visit your local Hyundai dealership this summer. Both the Veloster sports car and the Elantra compact car have been called Best Values from another industry authority under a different set of criteria, while heavily-updated versions of the popular Elantra and Santa Fe XL are arriving for model-year 2017, further pushing value, technology and styling. Hyundai is rolling out the latest in connected technology to more models than ever lately, including Apple CarPlay and Android Auto functionality on numerous new models and putting the very latest in Smartphone integration at the driver’s fingertips. Further, advanced safety systems like Autonomous Emergency Braking, Lane Change Assist, and Forward Collision Warning are rolling out to more and more Hyundai models, answering the call of safety conscious shoppers after world-class safety tech without the world-class pricetag. Further, Hyundai will soon launch their Ioniq model range for model year 2017, on a dedicated vehicle platform with three electrified low and zero-emissions powertrain choices. The Ioniq will offer hybrid, plug-in hybrid, and pure-electric options to suit the needs of any driver, in any locale. The Ioniq range joins the currently available Sonata Hybrid, and the Sonata Plug-in Hybrid. To test drive any of Hyundai’s new, updated, award-winning and highly innovative models for yourself, visit with us today.